According to a report from Japanese blog Mac Otakara on Monday, rumors circulating in Apple's supply chain suggest the company plans to shoehorn the oversized OLED panel into a chassis with dimensions nearly mirroring that of iPhone 8 Plus. The largest of three new iPhones anticipated to launch this fall, the 6.5-inch "iPhone X Plus" is expected to feature an iPhone X design with edge-to-edge display and Face ID technology. Nixing the "chin" and "forehead" areas that on models like iPhone 8 are dedicated to the Touch ID home button and ear speaker, respectively, Apple makes room for a vastly enlarged touch panel. While its height and width are said to share similarities with iPhone 8 Plus, the 6.5-inch OLED iPhone could be 0.2mm thicker than the existing handset to accommodate a vertically stacked rear-facing camera array, sources said. Until iPhone X, all dual-camera iPhone setups were arranged horizontally, but the slew of components needed to accomplish TrueDepth and Face ID forced Apple to reposition the rear shooter. That change will apparently carry over to the larger-screened successor. As for the upcoming iPhone X revamp, supply chain sources said only minor external changes are due for the expected 5.8-inch OLED version. The handset's chassis is rumored to be identical to that of the current iPhone X, but with a slightly larger rear camera lens to make way for a bigger camera sensor or sensors. Sources say the next-generation operating system includes an update to Apple's recognition algorithms that will allow users to unlock and authenticate while the handset is in a horizontal position. The addition would be a welcome enhancement for users who frequently operate their device in landscape mode. 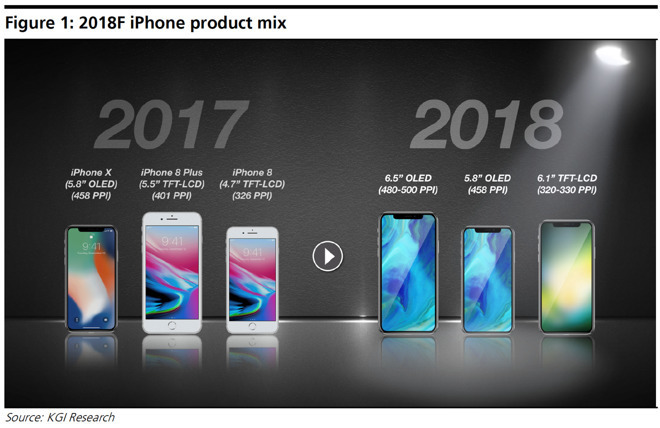 Finally, today's report reaffirms rumors that a low-end iPhone model will rely on LCD technology. Of note, sources claim the device's panel might come in at 6 inches, not 6.1 inches as previously thought.